In October 2014, the seventh major revision of the 27-inch (69 cm) iMac was announced, whose main feature is a "Retina 5K" display at a resolution of 5120 x 2880 pixels. The new model also includes a new processor, graphics chip, and IO, along with several new storage options. The seventh major revision of the 21.5-inch (55 cm) iMac was announced in October 2015. Its main feature is a "Retina 4K" display at a resolution of 4096 x 2304 pixels. It has the same new processor, graphics chip, and IO as the 27-inch iMac, along with several new storage options. The announcement of iMac in 1998 was a source of controversy and anticipation among commentators, Mac fans, and detractors. Opinions were divided over Apple's drastic changes to the Macintosh hardware. At the time, Apple had suffered a series of setbacks as consumers increasingly opted for Wintel (Windows PCs) machines instead of Apple's Performa models. Many in the industry thought that "beleaguered Apple" would soon be forced to start selling computers with a custom interface built on top of one or more potential operating system bases, such as Taligent, Solaris, or Windows 98. Part of Apple's effort to maintain the Mac platform was trying to improve its retail strategy. To this end, Apple secured a deal with CompUSA to set up a "store within a store" section at many CompUSA locations. As these stores developed, however, they became a detriment to Apple sales, as CompUSA employees were unfamiliar with the Macintosh and directed customers to Wintel boxes instead. On October 16, 2014, a new version of the 27-inch (69 cm) iMac was announced, whose main feature is a "Retina 5K" display at a resolution of 5120 x 2880 pixels. The new model also includes a new processor, graphics chip, and I/O, along with several new storage options. This computer was designed with professional photographers and video editors in mind, with the 5K resolution allowing 4K video to be played at its native resolution in Final Cut Pro, with room for toolbars on the side. The original iMac was the first legacy-free PC. It was the first Macintosh computer to have a USB port but no floppy disk drive. Subsequently, all Macs have included USB. Via the USB port, hardware makers could make products compatible with both x86 PCs and Macs. Previously, Macintosh users had to seek out certain hardware, such as keyboards and mice specifically tailored for the "old world" Mac's unique ADB interface and printers and modems with MiniDIN-8 serial ports. Only a limited number of models from certain manufacturers were made with these interfaces, and often came at a premium price. USB, being cross-platform, has allowed Macintosh users to select from a large selection of devices marketed for the Wintel PC platform, such as hubs, scanners, storage devices, USB flash drives, and mice. After iMac, Apple continued to remove older peripheral interfaces and floppy drives from the rest of its product line. Borrowing from the 1997 Twentieth Anniversary Macintosh, the various LCD-based iMac designs continued the all-in-one concept first envisioned in Apple's original Macintosh computer. 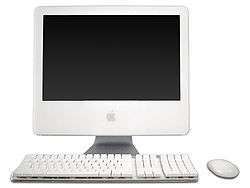 The successful iMac allowed Apple to continue targeting the Power Macintosh line at the high-end of the market. This foreshadowed a similar strategy in the notebook market when the iMac-like MacBook was released in 2006. Since then, the company has continued this strategy of differentiating the consumer versus professional product lines. Apple's focus on design has allowed each of its subsequent products to create a distinctive identity. Apple avoided using the beige colors then pervading the PC industry. The company would later drift from the multicolored designs of the late 1990s and early-2001s. The latter 2001s saw Apple using anodized aluminum; glass; and white, black, and clear polycarbonate plastics among their build materials. Today many PCs are more design-conscious than before iMac's introduction, with multi-shaded design schemes being common, and some desktops and laptops available in colorful, decorative patterns. Apple's use of translucent, candy-colored plastics made millions in more sales and inspired similar designs in other consumer devices (e.g., kitchen countertop grilling machines; portable electronics; pencil sharpeners; and, video game consoles and peripherals (including the Nintendo 64, which was released in special edition 'Funtastic' colors). Apple's later introduction of the iPod, iBook G3 (Dual USB), and iMac G4 (all featuring snowy-white plastic), inspired similar designs in other companies' consumer electronics products. The color rollout also featured two distinctive ads: one called 'Life Savers' featured the Rolling Stones song "She's a Rainbow" and an advertisement for the white version had the introduction of Cream's "White Room" as its backing track. Apple faced a class-action lawsuit filed in 2008 for allegedly deceiving the public by promising millions of colors from the LCD screens of all Mac models while its 20 inch model only held 262,144 colors. This issue arose due to the use of 6-bit per pixel Twisted nematic LCD screens. The case was dismissed on January 21, 2009. While not a criticism of iMac per se, the integrated design has some inherent tradeoffs that have garnered criticism. In The Mythical Midrange Mac Minitower, Dan Frakes of Macworld suggests that with iMac occupying the midrange of Apple's product line, Apple has little to offer consumers who want some ability to expand or upgrade their computers, but don't need (or can't afford) the Mac Pro. For example, iMac's integration of monitor and computer, while convenient, commits the owner to replacing both at the same time. 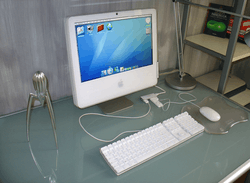 For a time before the Mac mini's introduction, there were rumors of a "headless iMac" but the G4 Mac mini as introduced had lower performance compared to iMac, which at the time featured a G5 processor. Some 3rd party suppliers such as Other World Computing provide upgrade kits that include specialized tools for working on iMacs. Similarly, though the graphics chipset in some Intel models is on a removable MXM, neither Apple nor third parties have offered retail iMac GPU upgrades, with the exception of those for the original iMac G3's "mezzanine" PCI slot. Models after iMac G5 (excluding the August 7, 2007 iMac update) made it difficult for the end-user to replace the hard disk or optical drive, and Apple's warranty explicitly forbids upgrading the socketed CPU. While conceding the possibility of a minitower cannibalizing sales from the Mac Pro, Frakes argues there is enough frustration with iMac's limitations to make such a proposition worthwhile. This disparity has become more pronounced after the G4 era since the bottom-end Power Mac G5 (with one brief exception) and Mac Pro models have all been priced in the US$1999–$2499 range, while base model Power Macs G4s and earlier were US$1299–$1799. The current generation iMac has Intel 3rd generation i5 and i7 processors, ranging from quad core 2.7 GHz i5 to a quad core 3.4 GHz i7 processor, however it is possible to upgrade the 2010 of iMac quite easily. ↑ "Apple Updates iMac". Apple. Retrieved September 24, 2013. ↑ "Apple Introduces 27-inch iMac with Retina 5K Display". Apple. Retrieved October 16, 2014. ↑ "Apple adds retina display to new iMacs". Brett Molina. Retrieved October 13, 2015. ↑ "Apple Confidential: The Day They Almost Decided To Put Windows On The Mac Instead Of OS X!". Hancock ordered her staff to consider Microsoft's Windows , Sun Microsystems' Solaris, and even the ill-fated Taligent, which Apple had handed off to partner IBM in December 1995. Hancock was partial to Unix-based Solaris, while COO Marco Landi preferred cutting a deal for Windows NT. ↑ "Apple snags deal with CompUSA". ↑ "Desktop Critic: CompUSA: Apple's Not-So-Superstore". ↑ Hawley, Brenna (June 4, 2012). "Man behind iMac name: Simplicity drives business growth". Kansas City Business Journal. Retrieved March 30, 2013. ↑ Raletz, Alyson (June 7, 2012). "Man who came up with iMac name tells what the 'i' stands for". Kansas City Business Journal. Retrieved March 30, 2013. ↑ "The First iMac Introduction". YouTube. January 30, 2006. Retrieved July 6, 2011. ↑ Jeff Goldblum. iMac Bondi 3 steps (Internet). Apple. ↑ "iMac Review: It's a Mac". Washington Apple Pi. December 13, 1998. Retrieved July 6, 2011. ↑ "Apple Announces New iMac With Next Generation Quad-Core Processors, Graphics & Thunderbolt I/O Technology". Apple. May 3, 2011. Retrieved July 6, 2011. ↑ "Apple - iMac with Retina 5K display - Features". Apple Inc. Retrieved 24 February 2015. ↑ "Compaq Hopes to Follow the iMac". ↑ "Eight ways the iMac changed computing". Macworld. August 15, 2008. Retrieved August 27, 2008. ↑ Walt Mossberg (November 30, 2005). "A New Gold Standard for PCs". All Things Digital. Retrieved June 29, 2007. ↑ Jon Swartz (April 14, 2000). "Resurgence Of An American Icon". Forbes. Retrieved November 24, 2006. ↑ Rich DeMuro (November 22, 2006). Must-have desktop: Apple iMac Core 2 Duo (24-inch, 2.16 GHz). CNET (Internet). ↑ Sanders v. Apple Inc. , 672 F.Supp.2d 978 (N.D. Cal. January 21, 2009). ↑ Frakes, Dan. "The Mythical Midrange Mac Minitower". Macworld. Retrieved July 6, 2011. ↑ Bangeman, Eric (December 29, 2004). "Apple supposedly prepping cheap "headless iMac"". ARStechnica. Retrieved July 6, 2011. ↑ Berger, Jennifer (January 26, 2005). "Mac mini: Perfect Bookshelf Box for Mac Minimalists". Macworld. ↑ "iMac Technical Specifications". December 10, 2012. ↑ Rawlins, Stephen (April 15, 2012). "Upgrade iMac Intel Core i3 CPU to Core i7". EnglandGreen. ↑ "Mac OS X versions (builds) included with Intel-based Macs". Apple. April 21, 2010. Retrieved May 16, 2010. ↑ "New 27-inch iMac orders won't ship until January | Macworld". Macworld. Retrieved January 15, 2013.